Are you still thinking of whether to buy the Canon SX150 IS, or do you already own the camera? Regardless of which, nothing beats reading the owner’s manual cover-to-cover to get a comprehensive understanding of operating the camera, camera settings, features and the available range of functionality. Canon PowerShot SX150 IS – Camera User Guide – 11.4 MB, 200 pages. 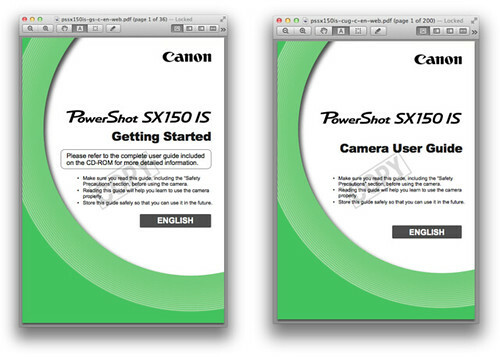 Canon PowerShot SX150 IS – Getting Started – 2.3 MB, 36 pages. If the direct download links didn’t work for you, visit Canon USA’s official Brochures & Manuals page for the SX150 IS and download from there. There is a “Copy” watermark displayed on every page though, and copying text from the PDFs do require a password. On a personal note, I’m disappointed to find, on page 80 of the Camera User Guide, that the macro mode only works from the end of the lens at maximum wide angle. At this focal length (zoom point), you can focus on a subject in the 0–50cm (0–1.6ft) range, but close-ups taken at wide-angle generally don’t look great. The reproduction ratio (how large the subject appears in the final photo) would be pretty poor too, something to consider if you like snapping pictures of bugs or very tiny objects on a regular basis. Canon SX150 IS — Main page.